Deakin director of digital marketing, Matt Edge, told CMO the decision to overhaul the website from the ground up was driven by a commercial need to better align digital content and experience to the needs of both prospective students as well as industry and community groups. However, Deakin’s website had become unwieldy, stretching over more than 12,000 pages that were authored autonomously by hundreds of staff across the university. It also featured information for staff and current students that was better served via existing internal intranets, he said. The new-look website was created in partnership with creative technology agency, DT. The brief was not just to create a leading public-facing website, but one that could compete with the experience provided by digital leaders such as Uber and Airbnb, Edge said. Work began in 2015, when DT undertook user research to gain insights about Deakin’s public-facing audiences. These insights were fed into an 'experience vision’, which the agency said helped formulate key pillars underpinning the new-look website. From there, DT developed and undertook work around experience strategy, user research, experience design, art direction, content strategy and content writing. Deakin has now whittled down its website to 1200 pages, a feat achieved just by looking at the target audience as well as consolidating information into a centralised form and process, Edge said. Core to its new approach is being user centric, he continued. “We did a lot of research into all our public audiences, finding out the fundamentals, requirements. That guided us all the way through, then we did extensive user testing,” he said. 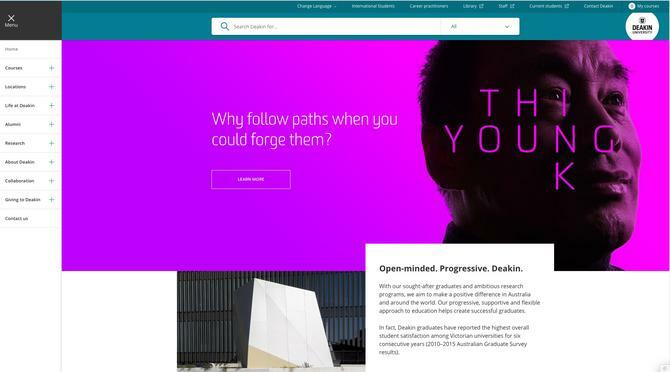 With half of all users now accessing the site via mobile devices, Deakin adopted a vertical navigation bar, and also put the emphasis on course journey. In addition, there is a competence function tool for courses as well as the ability to share information with friends and family. Personalisation is also there, Edge said, and Deakin has started using rules-based data decisioning to tailor the website experience to what a consumer’s interests are as they browse the site. As Deakin’s investment into marketing automation gains sophistication, this personalisation will increase, he said. Of course, with a historic list of website authors going into the hundreds, stakeholder management was vital in the success of the redesign. Edge said it identified between 50 and 60 key website authors out of an original list of 300, then included these individuals in his team’s fortnightly agile sprints. “Experience design, research technology are the easy parts,” he said. “Stakeholder buy in and collaboration was the toughest thing and the team coming together to do this work new that from the start. Another important decision from the outset was to establish a centralised team with accountability and responsibility for the digital website project and core pillars of the website itself. While Deakin’s esolutions team retains some technical governance and role, core business ownership of information architecture, website governance, content and user experience is now firmly in the hands of marketing and its digital website team. Edge said he brought in a new team to support the project that has since become the business as usual group. The program director, for example, is now Deakin’s Web channel manager, while content remains with the Web content manager. The team also includes business analysts and analytics, technical support and content producers. Staff on the public-facing site are also working closely with current student and staff intranet teams on information architecture, Edge said. Having a more sophisticated, cutting-edge website is just one part of Deakin’s wider efforts to become a digital pioneer. The university is also known for its investments into using IBM’s cognitive computing platform, Watson, its social media command centre, and also just launched a virtual reality studio and course.